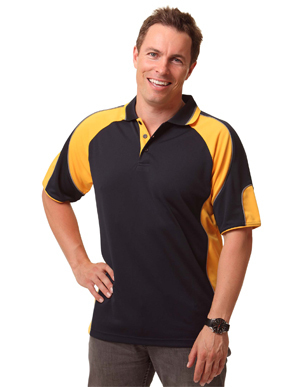 Men's CoolDry� Contrast Polo with Sleeve Panels CoolDry� Mini Waffle 160gsm - 100% Polyester Stylish flat knitted collar. Contrast panels on sides, sleeves, inside placket and on collar. Black/aqua, black/ash, black/orange, black/red, black/white, bottle/gold, bottle/white, maroon/white, navy/aqua, navy/gold, navy/red, navy/white, red/black, royal/white, sky/navy, white/navy, white/red or white/royal.